Like lavender essential oil, there are so many ways you can also use lemon essential oil! There’s a reason why it’s included in the beginner essential oil kits – so many benefits and uses! This is another oil I always want to make sure I’m stocked up on. I use it every single day. Lemon is well-known to be a powerful cleanser which is why you see it being used in so many natural cleansers. Even the brand name cleansers all have lemon scented products. It makes your home smell clean and inviting. Here is a list of 20 practical ways you can use lemon essential oil in your home and on your family. As you can see there is a variety of uses – many that were completely new to me until a couple months ago! 1. Cleanses the air of smells. Lemons smell fresh and clean! Diffuse some lemon essential oil to rid your home of unpleasant odours. I always diffuse lemon essential oil after I make eggs because I can’t stand the lingering smell breakfast leaves behind. 2. Degreases dirty dishes and hands. Add some lemon essential oil to your dish soap to cut the grease on those really dirty dishes. Alternatively, if you have greasy hands that just won’t come clean with soap, add a couple drops of lemon essential oil to your lather. 3. Clean naturally. Make your own natural cleaner with water, lemon essential oil and a splash of white vinegar in a spray bottle. It works great as an all-purpose, chemical-free cleaner. 4. Clean your microwave. Add water, a few drops of lemon essential oil and a splash of vinegar to a bowl. Microwave on high for five minutes. Let sit for a few minutes. Then remove the bowl and wipe out the microwave with a damp cloth. Stuck on food should just fall off and it will smell clean and fresh! 5. Polish your wood furniture. Make your own natural furniture polish with olive oil and lemon essential oil. 6. Kills aphids. Get rid of annoying aphids that feast on your plants with a mixture of lemon essential oil and water in a spray bottle. It also won’t hurt your plants. 7. Add to your cooking/baking. Use a couple drops of lemon essential oil to add an extra zip of flavour to desserts like lemon bars, cake, tarts or savoury dishes like lemon garlic shrimp and lemon dressing. 8. Flavour your water. Add one or two drops to a tall glass of cold water. My aunt swears that drinking lemon water before meals helps keep her slim and curbs cravings. I like it because it is refreshing and I don’t feel as hungry. 9. Soothe a sore throat. Add lemon essential oil, honey and some hot water to a mug to make your own “tea” to soothe a sore, irritated throat. 10. Fight nail fungus. Keep your nails pretty (and fungus free) by rubbing lemon essential oil on your nail bed and cuticles. 11. Soften rough feet. Rub some lemon essential oil on your corns and calluses. I make a mixture of fractionated coconut oil and lemon essential oil and rub on the soles of my feet. 12. Wash fruit and veggies. Make your own fruit and veggie wash by adding some lemon essential oil to a bowl of water in your sink. 13. Helps cold sores. Add a drop of lemon essential oil to help speed up healing on a cold sore and help with pain. 14. Combat odours in enclosed spaces. Add lemon essential oil to a cotton ball and put in a fridge, car, closet or any enclosed space that needs a little pick-me-up. 15. Banish water spots. Add a little lemon essential oil to your dishwasher soap container to help get rid of those annoying water spots! I only need to do this when I’m using a cheap dishwasher cleaner. 16. Clean a sticky mess. Make your own natural Goo-gone by using lemon essential oil on a sticky mess like gum in your hair or leftover bandage adhesive. 17. Prevent apples from turning brown. If you are cutting up apples and not eating them right away, spray a little lemon essential oil and water on them to keep them fresh. 18. Brighten your mood. Add a little lemon essential oil behind your ears and on your wrists to help cheer you up. Lemon is a sunny, fresh smell that helps me get me motivated. 19. Disinfect your toothbrush. Keep your toothbrush fresh by adding a drop of lemon essential oil to it once a week. 20. Freshen smelly dishcloths. Add some lemon essential oil to your detergent and soak your dishcloths overnight. Then wash and dry like normal. It will get rid of that lingering rotten smell that never seems to go away! You might also like: How to use essential oils to clean your home. How do you use lemon essential oil? 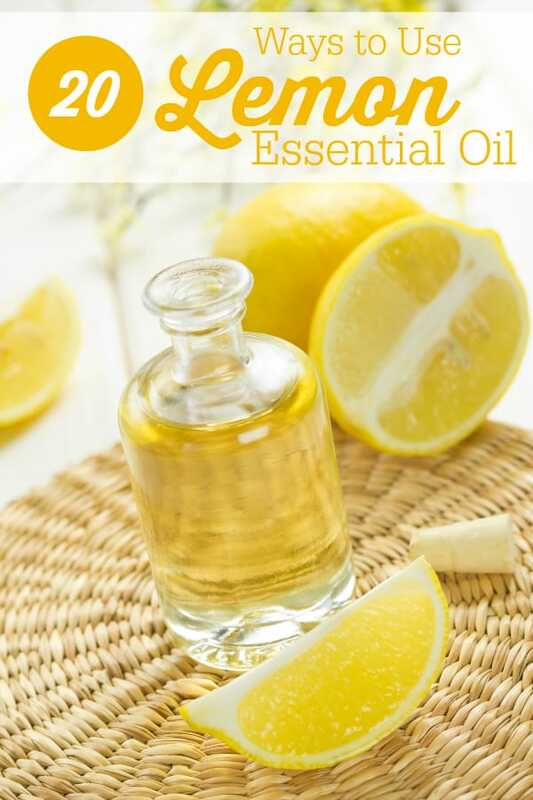 Some great uses for Lemon Essential Oil, I have been thinking about getting some essential oils to try. I will have to check out your online store. Will remember the aphid killing properties this summer! Thanks! I use a lot of my oil for the natural cleaning, since they are not dōTERRA I do not put into my water, but this sure is a great list and thanks for sharing!! Have not tired lemon essential oil but I know I can use this a lot! I use it daily for flavoring my water, but I didn’t know all the uses. I really like that it cleans fruits and veggies and helps apples last longer. Big helps at our house. I’ve heard about the benefits of Lemon OIl….definitely curious to try some! I am definitely going to get some lemon essential oil. I love using my essential oils, I have a small collection. they always make the house smell nice and fresh. Thanks for all the great tips on how to use lemon oil! Well these are twenty good reasons to want this awesome oil in my home!I am definitely loving it and looking into getting some.Thank you for all the great ideas of how to use it. It is amazing at how much you can do with just one essential oil! I am going to have to learn about these essential oils and what to use them for. I love the scent of lemon. I didn’t realize that there are so many uses for its oil. Wow, thanks so much for the information on the Lemon Essence Oil, it’s so versatile and I can’t wait to try them. Wow thanks for sharing all this! There’s lots I want to try. I’ve read about using lemon essential oil to clean the microwave. This is worth picking up for the many uses it has. Very useful info on lemon essential oil, great to know there are so many uses for this natural product. Thank you for all the great uses for lemon essential oils. I haven’t used essential oils, but this is convincing me to try. Thank you! I like putting a couple of drops into my water. Really refreshing! wow never knew i could make household cleaners from this, really need to hop on the lemon train I guess. I didn’t know that lemon essential oil could be used to kill aphids. I prefer to not use pesticides and now I have another tool in my box. I didn’t know that you could get lemon essential oil. This is so neat. I will definitely buy a bottle of this when I stock up on my other oils.